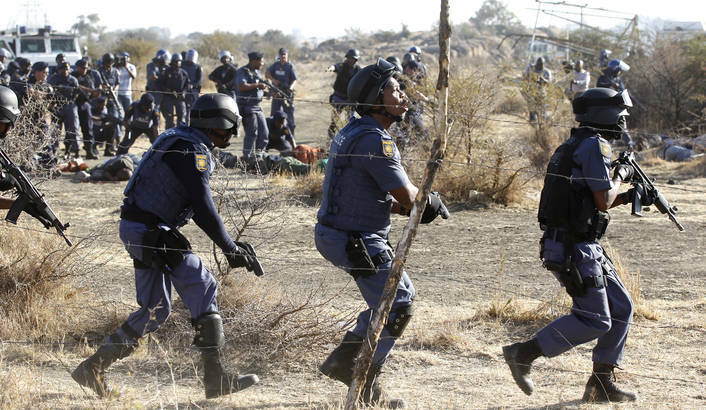 Should the Marikana massacre have killed the positive thinking industry? Home > Should the Marikana massacre have killed the positive thinking industry? In August 2012 South African police shot dead 34 mine workers at Marikana in a massacre that horrified the world. As the post-mortems rolled in there was plenty of blame to go around for the mining company Lonmin, union leaders, and politicians. No blame however was attributed to the positive thinking industry. That is not the kind of narrative mainstream media deals in: too complex, too demanding on research time, and perhaps even too counter to a popular trend. Yet there is a strong argument that positive thinking could take part of the blame for the massacre, that the events should have acted as a wake-up call to an industry that is, by its nature, difficult to criticise. Positive thinking grew into a fully-fledged industry in the 1970s and 80s as more and more people pursued the notion that one’s first duty is to improve oneself. The self-help sections of bookshops are now full of books that repeat the same message, most notably in recent years Rhonda Byrne’s The Secret. You can be anything you want to be, says the positive thinking industry, the only barrier to your success is your own thinking. One organisation has ridden high and become rich on re-packaging positive thinking. Landmark runs courses around the world – for a fee of course – with a syllabus that says things like ‘If someone says to us, “X is possible,” we would normally understand them to mean that X does not now exist, and that its existence, even someday, is not certain. Our use of the word possibility is different from this ordinary usage. We are not speaking about something remote or something that may happen out in the future.’ By the force of positivity we can speak things into existence. Several journalists have described the experience of being on a Landmark Forum course, a stand-out sample being Laura McClure for Mother Jones[i], who emphasises the highly commercial nature of the organisation: being on one course is an opportunity for them to sell you the next course. Landmark is a successor organisation to Erhard Seminar Training, which may be familiar to some from watching Adam Curtis’ documentary Century of the Self. Landmark’s strategy, now toned down from the aggressive methods of Erhard, is outlined in a best-selling book by Steve Zaffron and Dave Logan (a CEO and management consultant respectively) called The Three Laws of Performance, complete with a recommendation from Archbishop Desmond Tutu. Despite the importance of the idea in the title and the constant reference to it throughout the book, the book speaks of performance in a strangely ambiguous manner. ‘The only thing that matters is performance’, it says, yet it never says performance in what. We end up assuming, since most of the examples used are business cases, that it must be the performance of a company on the stock market. So what are the Three Laws, according to Zaffron and Logan? The first law of performance says: ‘How people perform correlates to how situations occur to them’. This is a way of saying that your take on a situation is subjective. You can therefore change it. This is also, incidentally, one of the major concepts of the pseudo-science of Neuro-Linguistic Programming, much beloved of the Department for Work and Pensions. The second law says that you don’t create change by changing the world, you do it by changing language. Then the third law kicks in: ‘Future-based language changes how situations occur to people’. This is a relatively sophisticated version of positive thinking but is fully a part of it. We don’t change the world by changing material conditions in the world or by excavating the past to find out how we ended up here (‘start filing your past in your past’ says Landmark). We change it by looking at the world differently, by speaking positive words. Of course now we all know the grim irony of this story. In 2012 the actions of Lonmin security, union leadership and South African police resulted in a massacre in which the police killed 34 people and wounded 78 others. Videos of some of this massacre are available online. I don’t advise watching them unless you are feeling particularly strong and resilient. As the horror of the massacre became known around the world, the Landmark program around Marikana never received a mention. Admittedly Mills had moved on in 2008, but the Landmark program is supposed to equip its students with long term tools for ‘elevating performance’. What had gone wrong? Could it be that future-oriented positive thinking wasn’t enough? A cold hard assessment of the facts at Lonmin might have revealed to the management what their workers already knew: that they weren’t paying people enough for such a tough job. It might have revealed to everyone involved that the interests of the management and workers were at odds, that the racial tensions between management and workers (that Landmark thought they were solving) might have an economic element. The workers and management were set on a collision course unless more concessions were made to the everyday needs of the workers. Ceaseless optimism about the future only makes for a greater shock when things go wrong; by fighting to maintain only positive beliefs about the future, the positive thinker ends up being less prepared, and more acutely distressed, when things eventually happen that he can’t persuade himself to believe are good. This raises the question of whether the positive thinking industry is not merely wrong in a harmless way, but runs the risk of causing considerable damage. It is difficult to excavate all the causes of the Marikana massacre, and we can’t state for certain that a period of blind optimism was a factor behind it, but we do know that intensive training of thousands of people by one of the largest positive thinking peddlers in the world did nothing to prevent the worst massacre in South Africa since the end of apartheid. Dave Logan has commented on the massacre in a blog post[ii] for Huffington Post. He describes finding an animal killed by a lion while he was out running near Marikana. “What a perfect metaphor for Lonmin. The beauty and potential of the situation was in almost perfect balance with the danger.” But this is with hindsight: at the time it was only described as a ‘breakthrough’, not as a dangerous situation. It’s true that the leadership team had changed between the Landmark intervention and the massacre. But no reference was made to the ‘delicacy’ or ‘fragility’ of this new positive future in the book. It’s almost as though we need to be constantly schooled in positivity for it to have any effect, as though we must constantly convince ourselves. Barbara Ehrenreich in her book Bright-sided, along with many others has begun to question the value and evidential basis of the positive thinking industry. This can be an uphill struggle – the industry does not take criticism or ‘negativity’ well. But surely we must question this ideology of our age in the light of evidence, including the evidence of its claimed successes. Should the Marikana massacre have killed the positive thinking industry? Perhaps that is too strong, but it should at least have dealt it a hefty blow. The brutal events of 2012 can teach us something powerful: you cannot always resolve the problems in your life, or of your engagement with others, just within your head. We operate in an external environment only partially under our control. Some problems are beyond the reach of positive thinking, and judging the appropriateness of positivity in a given situation could mean the difference between happiness and unhappiness, or even life and death. To clarify the facts in this initiative, the work was carried out by Lonmin Executives, employees, unions and community people supported by Vanto Group, Six Sigma, and many other consultants and NGO’s including Desmond Tutu’s Foundation, not Landmark. Also it is a gross misrepresentation to suggest that the work done at Lonmin was simply positive thinking. It was a comprehensive strategy that directly addressed long standing issues at the mine and surrounding community that were already on a dangerously unsustainable course. As the Dave Logan Huffington Post article you link to notes, the initiative was suspended by new management nearly 4 years before the massacre. It makes one wonder what might have been if it was allowed to continue.